The title of Fellow is granted to Designated Members who have distinguished themselves by their exemplary contributions to the profession. This is demonstrated by a high level of excellence and achievement that has contributed to the advancement of the profession. 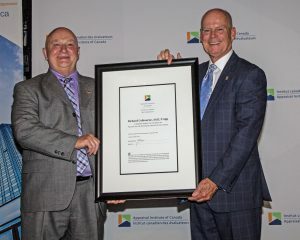 The Fellowship Award is granted at the discretion of the National Board of Directors. Rick received his AACI in 1994 and has specialized in property tax assessment, valuation and consulting. 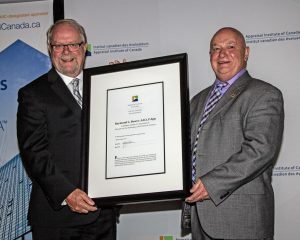 He has held leadership positions in property assessment and taxation with a municipality and two provincial governments. He had long career with the Government of Canada and his career has given him the opportunity to work in most provinces of Canada. 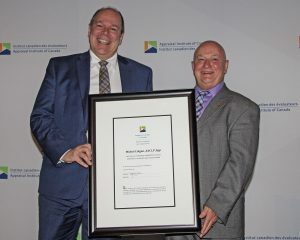 He is a Past-President of the Nova Scotia Real Estate Appraisers Association and was an active Member of the Nova Scotia Real Estate Appraisers Association. Rick has been on the AIC National Board since 2013 and has chaired the Audit and Finance Committee, the Marketing and Communications Committee and the Professional Practice Committee. He was elected President-Elect of the AIC in June of 2016 and assumed the role of President in June of 2017. Although retire, he is currently the Senior Director Valuation, Property Tax and Training with Young and Associates Real Estate Appraisals and Consultants Ltd. with offices in Bridgewater and Truro, Nova Scotia. Michel Colgan joined the Appraisal Institue of Canada in 1997 and was elected the President of the Quebec Association, a role that he held until 2008. He then acted as past-president of the Quebec Association for an additional four years. In 2008, he was also nominated to represent the Quebec membership at the AIC National Board, a position that he held for one year. Over the last decade, Michel continues to devote his time as a Professional Competency Interviewer, participating in numerous interviews of Candidates who are on their final steps to designation. Michel is a dedicated and passionate AIC Member, and as Managing Director of Valuation & Advisory Services in Montreal, he is an avid champion for the association and for the success of the new generation of AIC Members. Raymond Bower has been a committed AIC Member for 42 years. He joined in 1976, received his CRA designation in 1978 and his AACI in 1986. Ray has held numerous positions at the provincial and national level and has been a committed volunteer for 30 years. He is a Past President of the AIC-Ontario, currently on of the few Professional Practice seminar lecturers for the AIC and was one of the original lecturers from 1992 when Ethics Seminars were first introduced by the Appraisal Institute of Canada. Furthermore, he was instrumental in the creation of the first CUSPAP released in 2001 and assisted in developing the curriculum for CUSPAP Recertification. Ray has also dedicated his expertise to the national Professional Standards Adjudicating Committee, Standards Committee, Special Investigator for PPC, and represented AIC on an International Valuation Standards Sub-Committee. At the provincial level he has served as Chapter Chair, Member of the Board of Directors, President of the Board, served on the Professional Development Committee and Finance Committee , Stakeholder Committee and various Task forces over many years.